In our commitment to help you find products that can help you achieve the clearer skin you want, we present to you 5 of the best peptide face creams you can get your hands on today. The products that made it to this list have been carefully selected based on ingredients, formulations and their intended benefits to the skin. Mad Hippie Skin Face Cream with Anti-Wrinkle Peptide Complex contains the more recent Matrixyl 3000 to give your skin a tightening effect. Aside from this ingredient, we also like that it contains argan oil as well. One downside of this product, however, is its costly price for just 30ml. However, for its benefits, we feel that the price is actually worth the shot. 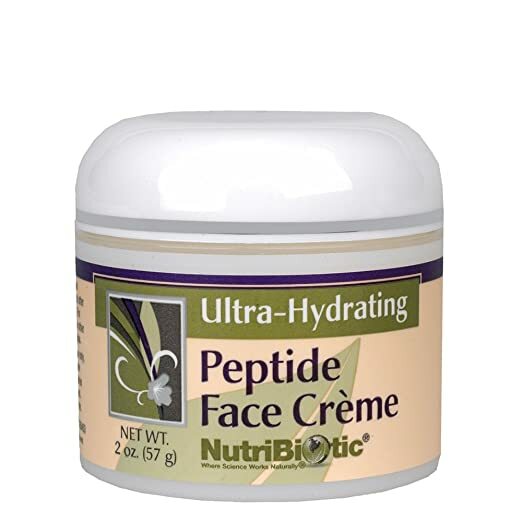 Nutribiotic Anti-Aging Peptide Face Creme is created both for men and women. Because it isn't gender-specific, it carries no strong scent. We like that it gives you a 57g of product for an affordable price. Although hydrating, some people may find an issue with its consistency being thin to runny. 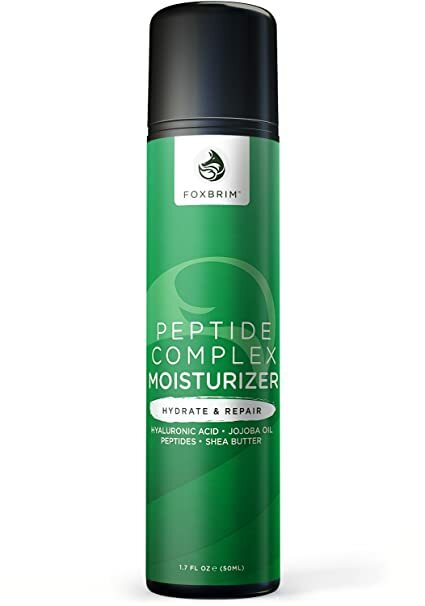 Foxbrim Peptide Complex Moisturizer﻿ has a lot of anti-aging ingredients. Aside from peptide, it also has hyaluronic acid and jojoba oil. If you are into makeup, we recommend using this product as it leaves a matte finish on your skin. It's fragrance-free and good to use if you have sensitive skin. 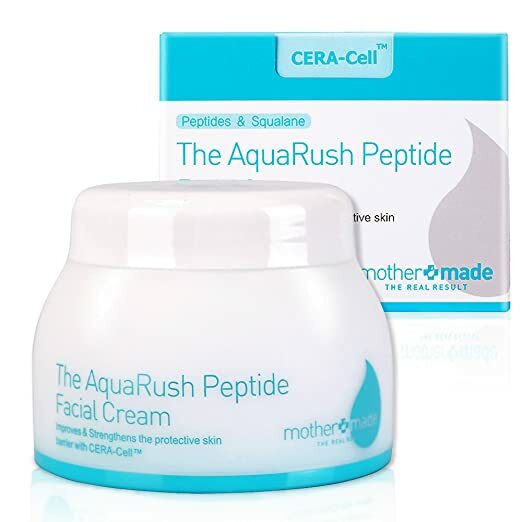 Mothermade The AquaRush Peptide Facial Cream also has a quality set of hydrating ingredients. On top of its peptide, it has vitamin E, four essential oils and microcapsules to deliver its squalene, hyaluronic acid and ceramides. NutraNuva Face Food - Anti Aging Cream & Eye Wrinkle Moisturizer is a great option for those looking for a really potent product. It doesn’t just contain copper peptides; it also has loads of great anti-aging ingredients. If you are ready to get younger-looking skin, here are our editor's top picks for the best peptide face creams. Mad Hippie Skin Face Cream with Anti-Wrinkle Peptide Complex contains Matrixyl 3000 which is one of today’s in-demand anti-aging ingredient. Aside from this powerful peptide, this cream also has Argan oil, green tea extract and coconut oil. For its price, you’ll get a 30mL product that comes is a small pump bottle. A few people who have bought the product find this price a bit expensive. The cream is light and refreshing to use on the skin. Some users even keep it inside fridges for a cooler effect. Nutribiotic Anti-Aging Peptide Face Creme has palmitoyl pentapeptide-4 and acetyl hexapeptide-8 as its main peptide components. This cream is formulated for both men and women. It’s even good to use as an aftershave moisturizer. It comes in a 57g jar. Because it contains a lot, you’ll have a lot of product to work with daily. Because it’s not gender-specific, this cream doesn’t have any strong scent. It can make your face look refreshed and well moisturized. Its consistency is light but you can expect it to hold moisture for long hours. For some users, however, the cream tends to be a bit runny. Foxbrim Peptide Complex Moisturizer can help restore and even out your skin tone through the help of its powerhouse ingredients. Its peptide content, for one, can minimize the visibility of your fine lines by targeting collagen production. Aside from its peptide, we liked that this moisturizer also has hyaluronic acid, jojoba oil and vitamin B5. The combination of these ingredients do not only address wrinkles, but it can also boost your skin’s elasticity and hydration. This product is great to use on any skin type. It’s lightweight and fragrance-free which makes it safe to use even on sensitive skin. Users loved that the cream goes on smoothly when applied to the skin. It doesn’t leave any greasy feeling but instead leaves a matte finish. It even works well under makeup. The moisturizer comes in a pump bottle which makes dispensing very easy. One pump of the product can go a long way. Although it provides good hydration, people with extra dry skin found the product insufficient in keeping their skin hydrated. In case you’re one of these people who are into thick and creamy moisturizers, then this one may not be for you. Containing Acetyl Hexapeptide-8 and Copper Tripeptide-1, this product can help make your skin tighter and firmer. It uses a special technology called CERA-Cell that combines ceramides, squalene and hyaluronic acid into microcapsules that dissolve quickly on your skin. This facial cream has tocopherol acetate, also known as vitamin E, to combat free radicals as well. The product also has a good arsenal of hydrating ingredients with its 4 essential oils- shea butter, macadamia seed oil, argan oil and meadowfoam seed oil. Meadowfoam seed oil is rich in long tail fatty acids and is considered as a good alternative to jojoba oil. The product has a nice texture and consistency. You’ll feel your skin instantly hydrated after application. Users liked the luxurious feel they got from the cream. They also loved that it contains a lot of wonderful ingredients for the skin. Although it comes in a jar, the product comes with a spatula which you can use for a more hygienic way of dispensing. However, people who have tried the cream felt that a tube container would fit the product better. The cream does contain microcapsules so you should expect a bit of grainy texture upon application. It tends to go away once the capsules melt into your skin. If you are looking for a hardworking product, NutraNuva Face Food - Anti Aging Cream & Eye Wrinkle Moisturizer should have a solid spot on your list. Because apart from copper peptides, this one also has alpha lipoic acid, hyaluronic acid, collagen, COQ10 and other ingredients your skin will surely love. The combination of these ingredients makes the product really effective in doing its job. In fact, in the company’s research, dermatologists and plastic surgeons found that users experience 44.9% less noticeable wrinkles. And what’s more impressive with this cream is that it’s formulated without parabens, dyes and even sulfates. The product is fast absorbing and feels lightweight on the skin. You can wear it under makeup without having to worry about feeling sticky after. Take note that there’s a stinging sensation after using the product. It doesn’t however, last any longer than 60 seconds. Peptides in creams consist of short chains of amino acids that have a direct effect on collagen, a component that is mainly responsible for your skin’s structure. Collagen is also responsible for making your skin thicker and more supple. Without enough collagen, such as during the aging process, your skin becomes saggy and less elastic. It’s also one of the reasons why wrinkles form. Signal peptides can either cause new collagen to form or prevent existing collagens from breaking down. Neurotransmitter peptides can prevent muscle contractions by restricting the associated chemicals. Carrier peptides serve as a vehicle for other essential elements in entering your skin. Although there are several types of peptides today, we’re only providing you with the most common ones you’re likely to encounter in cosmetic products. Matrixyl 3000 is one of the most recent anti-aging ingredients to hit skin care products. It combines two other peptides, Palmitoyl Oligopeptide and Palmitoyl Tetrapetide-7, to stimulate dramatic collagen production in your skin. Palmitoyl Oligopeptide works more on the dermis which means you get better skin structure when you use this type. Palmitoyl Tetrapeptide-7, on the other hand, is more helpful in toning down inflamed skin. Palmitoyl Pentapeptide-3 is one of the oldest types of peptides you can find in skin care products. It’s more commonly known as Matrixyl. This form of peptide is more frequently marketed as Argireline, a potent anti-wrinkle ingredient. Skin care experts commonly refer to it as a more natural way of getting tighter skin without Botox and needles. Peptides are not magic creams and they can really take time to work. Generally speaking, most peptide creams are able to deliver around the fourth to twelfth week of use. When selecting the best peptide face cream, it’s essential that you set your expectations realistically. You need to make sure you use the product continuously along with proper skin care before you can see any dramatic change in your overall skin tone. We’re wrapping up this review with Mad Hippie Skin Face Cream with Anti-Wrinkle Peptide Complex as our top pick. Although it comes with a bit of an expensive price tag, we feel that compared with its benefits, the cost is all worth it. Aside from Matrixyl 3000, which is made up of two types of polypeptide, it also has Argan oil and green tea. This combination of ingredients makes the product very effective even in hot and humid climates. If you frequently use serums, we suggest giving this product a try. It absorbs quickly and leaves a refreshing feeling after application.